Ridgewood, New Jersey - U. S. Senator Robert Menendez and renowned advocates, actress Brooke Shields and former New Jersey First Lady Mary Jo Codey will stand with dozens of mothers and postpartum depression advocates to celebrate a major victory for women and their families that have been affected by postpartum depression. Postpartum depression is a devastating mood disorder which strikes many women during and after pregnancy that affects anywhere from 10 to 20 percent of new mothers. Seven years ago, on May 11th, 2007, at the invitation of U.S. 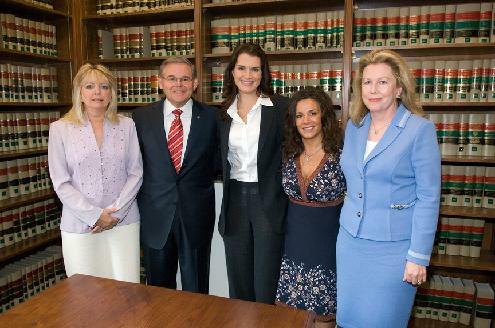 Senator Robert Menendez, actress and author Brooke Shields came to Washington DC to share her postpartum experience and urge Congress to pass The Melanie Blocker Stokes MOTHERS Act. Her compelling testimony further awakened our nation to the reality of pregnancy related mood disorders and the need for action NOW. She was joined that day by U. S. Senator Robert Menendez, Congressman Bobby L. Rush, Former NJ First Lady Mary Jo Codey, Carol Blocker - Melanie Blocker Stokes mother - Sylvia Lasalandra and Susan Dowd Stone, President of Postpartum Support International - at a press conference encouraging every stakeholder - every mother, father, sister, friend, family member, loved one, Congressman, Representative, Senator and health care professional to support this life saving legislation. On March 30, 2009, thanks to the ceaseless efforts of Congressman Bobbly L. Rush, the MBSMA passed by nearly unanimous bipartisan support out of the House of Representatives and now awaits consideration in the U.S. Senate H.E.L.P. committee, chaired by Senator Edward M. Kennedy. U.S. Senator Robert Menendez, the bill's senate sponsor, has pledged to persevere until the bill is passed. You can learn about the legislation's history and watch Brook'e entire speech by clicking here.